In 2016, Holley’s LS Fest will be the place to be for LS enthusiasts the world over for the seventh straight year. Competitors, spectators, and vendors will descend on historic Beech Bend Raceway in Bowling Green, Kentucky for a weekend of GM LS-powered drag racing, drifting, autocross, and more. 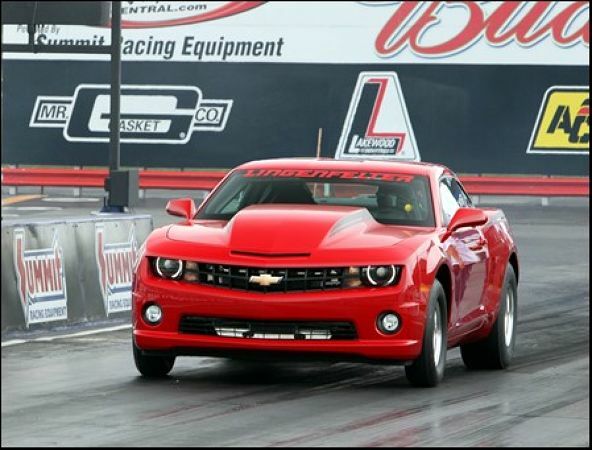 This year, the drag racing portion of the event will get a shot in the arm thanks to the School of Automotive Machinists and Lingenfelter Performance Engineering. With the COPO class being one of the most popular classes among spectators, the Holley LS Fest will be emphasizing the class in 2016. COPO racers will be pitted on-site in a special area reserved exclusively for them so that spectators can check out all of the COPO cars in one location. Also, qualifying will be run at special times during the event to make sure spectators have every opportunity to see the COPO Camaros in action. “The ‘Battle At The Green’ is a combination of great cars and a great race. SAM has competed at every Holley LS Fest and witnessed firsthand the continued growth at each event. We are proud to co-sponsor this class with Lingenfelter Performance Engineering,” said Judson Massingill, director of education, School of Automotive Machinists. The 2016 Holley LS Fest will take place on September 9, 10, and 11th at Beech Bend Raceway in Bowling Green, KY, while the Track X event will take place at the nearby National Corvette Museum Motorsports Park. Be sure to like the Holley LS Fest Facebook page page for more updates throughout the year. Dedicated to perfecting the art of automobile, light truck, and SUV performance and delivering innovative engineered solutions for over 42 years, Lingenfelter Performance Engineering is a globally-recognized brand in the performance aftermarket industry. Driven by owner Ken Lingenfelter’s quest for technology leadership and excellence, Lingenfelter offers vehicle customization, engine building and installation, engine packages, and high-performance GM aftermarket components to create drivable, reliable high-horsepower vehicles. For more information, visit www.lingenfelter.com or call Lingenfelter Performance Engineering at (260) 724-2552. Since 1985, the School of Automotive Machinists, based in Houston, TX, has provided the motorsports industry with well-trained graduates. The realization of the need for qualified performance engine builders originated with founders and owners Judson and Linda Massingill. SAM offers five programs to qualify students to become engine machinists. The programs are comprised of block, head, and CNC machining as well as EFI tuning and associate degree programs. The School of Automotive Machinists has placed graduates with top race teams in NASCAR, NHRA, IndyCar and other series. The School campaigns a COPO in NHRA Stock Eliminator, crewed by SAM students. For more information, visit www.samracing.com or call the School of Automotive Machinists at (713) 683-3817. *Note: The payout is set for a minimum 32 car field. If less than 32 COPO Camaros show up to compete, the purse will be adjusted based on the total number of participants.